A mix of clouds and sun. A stray shower or thunderstorm is possible. High 78F. Winds NNW at 10 to 20 mph.. Scattered thunderstorms this evening followed by occasional showers overnight. Low 48F. Winds N at 10 to 15 mph. Chance of rain 50%. Gold steel roses are among the varieties being sold as a fundraiser by the School of Mines' Welding Club. 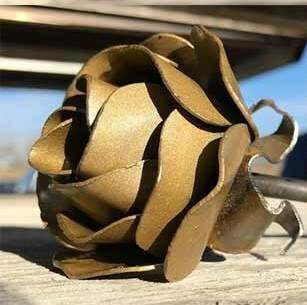 Members of South Dakota School of Mines & Technology’s Welding Club and 3D Printing Club are making and selling handmade steel and silky filament roses for Valentine’s Day. According to a press release, the steel roses cost $40 each and will be for sale through spring, and can be purchased at awsroses.com. Each steel rose will be different and come in a variety of colors. The 3D printed roses are $10 each and will be available at the school’s Sweetheart Dinner & Dance Feb. 15-16. These roses are red, blue or purple and have green stems. “The history of giving roses for Valentine's Day can be tracked back to the late 17th century where the giving of red roses represented passion,” said Kassidy Kitzmiller, a metallurgical engineering major and Welding Club president, in the press release. “With the variety of colors, you can choose a color that represents your everlasting feelings for that someone special." Proceeds will benefit Mines students, with the Welding Club purchasing items such as goggles, gloves and materials, and the 3D Printing Club dividing its proceeds between the Mines music scholarship fundraising and upgrading 3D printers.